Crisis pregnancy centers are faith-based non-profits that set up shop near legitimate abortion providers and/or in low-income areas where women are less likely to have access to reproductive health care and more likely to be susceptible to the false medical information and high-pressure counseling they dole out alongside free pregnancy tests. Here's a Colorlines investigation on how some Kansas City CPCs are specifically trying to "save" black and Latina babies — and how it's possible to help low-income women who want to carry to term without tricking them into doing so. Last December, Care Net—the nation’s largest network of evangelical Christian crisis pregnancy centers—featured a birth announcement of sorts on the website of its 10-year-old Urban Initiative. Under the headline, “Plans Underway for Care Net’s Newest Center in Kansas City, Mo. 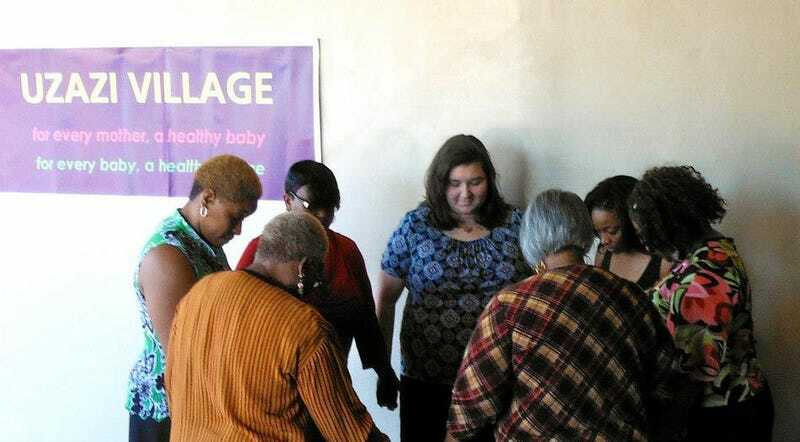 !” a block of upbeat text described how a predominantly white, suburban nonprofit called Rachel House had “made contact” with “various African American pastors and community leaders,” who helped them “plant” a “pregnancy resource center” in a predominantly black, poor section of downtown Kansas City. The deliberately homey, loft-like space has shiny wooden floors and African-inspired wall hangings. Here, Uzazi promotes natural, home-based childbirth. It also offers its clients free pregnancy testing and pregnancy confirmation for Medicaid eligibility; free doula and breastfeeding support; training for emerging doulas of color; STI/STD information and even support groups for LGBT youth. Payne doesn’t use the phrase “reproductive justice,” but Uzazi Village certainly embodies the concept.